I don't think I've picked up a book about vampires since I read the Twilight series, which was oh-so-addictive but which also watered down everything that makes vampires attractive. 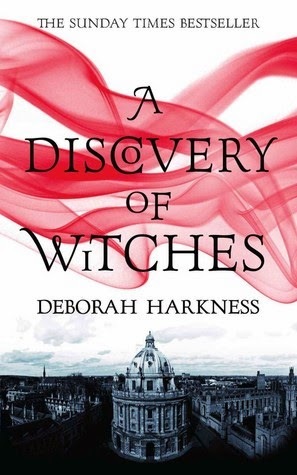 Thankfully, Deborah Harkness's A Discovery of Witches, the first in the All Souls trilogy, reminds me of why stories about supernatural beings like vampires can be so compelling. Diana Bishop is an American academic temporarily in Oxford when she stumbles across a manuscript which seems to respond to her powers as a witch. Having always tried to reject her powers, Diana tries to ignore it, but when other witches, daemons and vampires start taking an interest, Diana just can't get away. And when Matthew, a vampire who has lived many, many lives, becomes curious about Diana and the manuscript, Diana is forced into confronting her own powers in order to save herself, Matthew and their families from dangerous enemies. First off, Diana is a brilliant protagonist. She's complex, vulnerable, full of faults, super clever, brave and strong. I like that she's so layered, and so, so, so human, even though she's a very powerful witch. Harkness creates Diana the human being first and then adds in Diana the witch, so as a reader I can relate to, sympathise and empathise with Diana the human, and never feel Diana the witch is too far fetched or unbelievable, because she's motivated by her human emotions and needs. And Matthew, well Matthew is the perfect vampire - attractive, imposing, protective, but also sensitive and aware of his faults. I like that Harkness keeps the core vampiric elements alive - the need for blood, the coldness, the weariness, the knowledge that comes with being alive for so long - but also makes him flawed and human. Again, it's because of his more human elements, especially his closeness and complicated relationships with various family members, that make him so appealing. And Diana and Matthew together are a great partnership, and one that is made more interesting to read about because of the fact that the pair don't always see eye to eye. Diana isn't afraid to stand up to Matthew, but neither is she afraid to let him help when she needs it. Matthew also shows vulnerabilities towards Diana as he grows to trust her, showcasing a partnership of equals. Harkness is an academic herself, so the world of academia she places Diana and Matthew in is filled with rich details, from physical descriptions of Oxford and its colleges, to the descriptions of the many procedures and quirks that make up the UK collegiate system. Harkness also doesn't skimp on the details of Diana's work as a scholar and her research. I confess, a lot of Diana's work went over my head, but I appreciated Harkness deciding not to simplify or dumb things down. I understood enough of it that I could still enjoy the book, and understand the importance of what Diana discovered. And what Diana discovers leads to a vibrant, exciting, action-packed novel. As Harkness took Diana and Matthew across continents, I was swept up in their world. I particularly loved the secondary characters, especially Diana and Matthew's families, who widen the world Harkness creates and who add humour as well as emotional depth. In a sense, A Discovery of Witches is setting the scene for the remaining two books in the series, but it's a fulfilling read, with plenty of action, depth, and brilliant characters. I look forward to where, literally, Harkness takes Diana and Matthew next. How I got this book: From the publisher, Headline. This did not affect my review.